Purpose made jewellery for surface skin piercings. 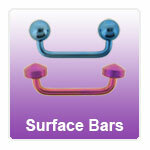 These barbells are designed to help relieve the stress placed on the healing piercing. Rejection for this type of piercing is common due to poor initial placement or lack of experience by the piercer. High quality Titanium skin surface bars in plain polished or anodised finish.